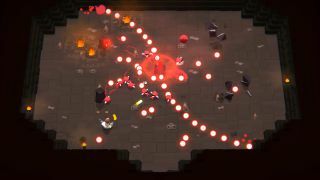 The shooty roguelike is out in Early Access now. Serious Sam is temporarily shifting perspectives as it takes a trip into series antagonist Mental's twisted mind. In Serious Sam: Tormental, instead of fighting an alien demigod and his angry minions in the real world, you'll be fighting your way through the place where he comes up with all his ideas for conquest and other nasty things. And it's a twin-stick roguelike, now. You know the score: procedurally generated dungeons, hunt down weapons and upgrades, death's kinda serious. Developer Gungrounds says Geometry Wars, Nuclear Throne, Binding of Isaac and Enter the Gungeon were all sources of inspiration, along with Serious Sam, of course. Because you're running around in Mental's mind, expect to uncover some of his secrets. He's coming up with new enemies and weapons, but you can break into hidden parts of his mind and pinch those ideas, turning them on their creator. There's also a bit of light crafting where you combine the random gun parts you find across the worlds conjured up by Mental's bad brain, constructing unique and more powerful tools of destruction. Diving into a demigod's noggin sounds risky, but luckily you've got a +1. Co-op makes bosses stronger but also lets you revive each other, giving you another chance to give Mental the worst migraine of his life. Reach the final area and you'll learn more secrets and information about Mental's identity, letting you stop him for good. Until he shows up in the next game, anyway. Serious Sam: Tormental is out now on Early Access, where it's expected to stay for a few months. This version has three areas, four boss fights, three playable characters, around 30 weapons and more than 20 upgrades. An early prototype is also available for free on Itch.io, so you can try before you buy.